Cre8 runs a wide range of activities and services for young people (usually aged between 8 right up to 25) and their families, from the Moss Rose Estate in Macclesfield. Our work is aimed towards empowering young people and adults in the local area to make change happen for themselves and also for their local neighbourhood. Want to be part of something that makes a real difference to your local community? There are many ways you can get involved. Cre8 is a local charity which has been doing work and providing services for young people in Macclesfield for the last ten years. From very small beginnings, Cre8 has grown to be a significant part of the neighbourhood and now employs a number of full and part time staff, as well as volunteers, running a variety of projects and two businesses. We provide an innovative service to young people and their families which we hope supports and enables people to play a full and active role in their neighbourhood. Cre8 is a community based on Christian values of Care and compassion, Social justice, Generosity, Forgiveness, Honesty and Trust. Many of our employees and volunteers live and are part of the neighbourhood we work in, which we think is very important. We look to model community living, this sometimes includes attending and being part of celebrations and other regular social activities such as ceilidh’s, shared meals and festivals. These events are open to a wide network of our friends, supporters and neighbours. 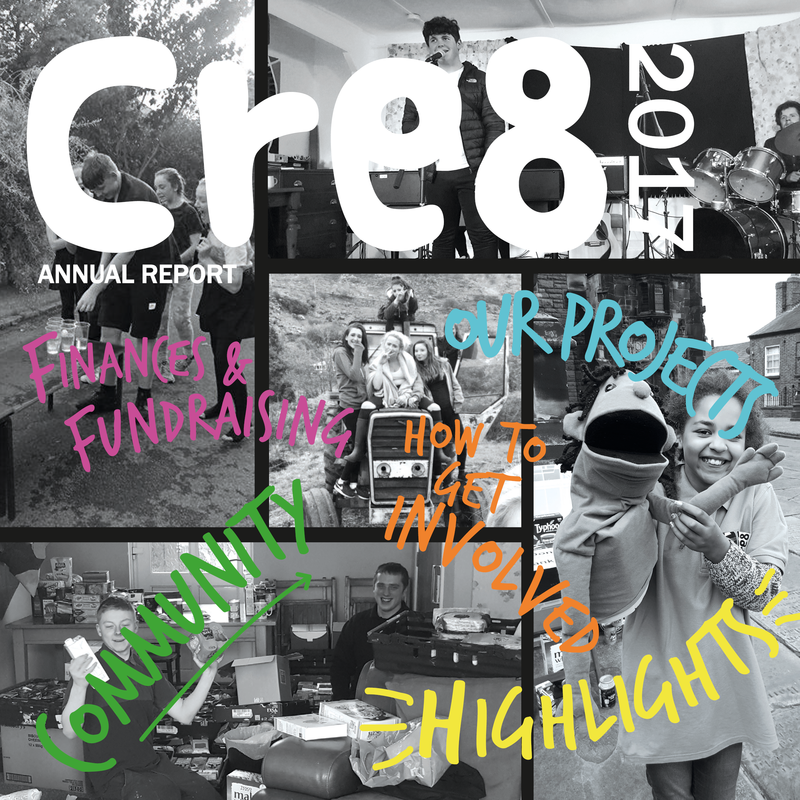 ​The report is designed and written entirely by Cre8 using photos that workers and volunteers have taken. It's Cre8 homemade! We hope you find it thought-provoking and inspiring. There are lots of way you can support Cre8 and be a part of what we are doing; volunteering, prayer, financial donations, or something from our wishlist. Whatever you can offer, little or something bigger, we really do appreciate your support. The end of an era: Rob's time at Cre8 is coming to an end. One of the best ways to keep connected with Cre8 is via our newsletters. Sign up below and you'll be added to our mailing list.